Land in Wales designated "Green Wedge" does not have the same status as the more familiar English Green Belt designated in England. Green Belt land has Statutory protection and cannot be changed without the agreement of Parliament. In Wales Green Wedge is designated by local councils. The Green Wedge between Bryncoch and Rhos has been designated as such since at least 1990. The above slide, taken from the Inspector’s report shows the current settlement limit of Bryncoch. The area of land enclosed in green is the land recommended for development. 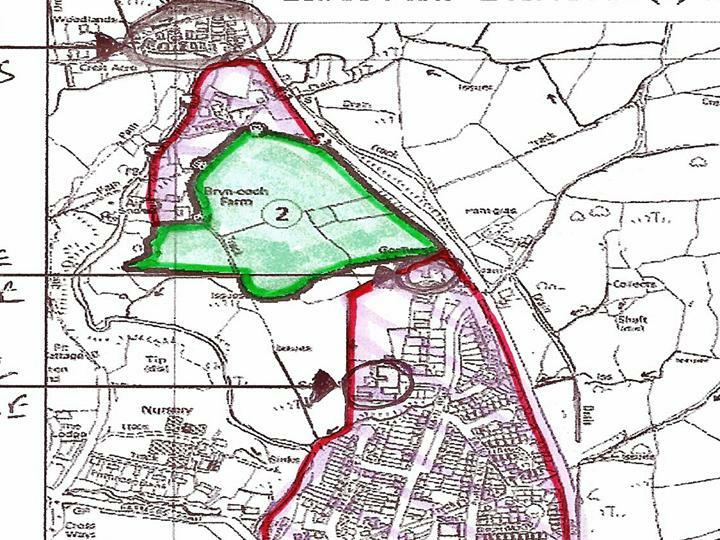 The new settlement limit for Bryncoch is outlined in red above the development site. This takes the settlement limit of Bryncoch to the river Clydach. The total area of land recommended to be removed from the Green Wedge is 12.25 hectares. The above map shows the current Green Wedge that extends from Bryncoch to Rhos. 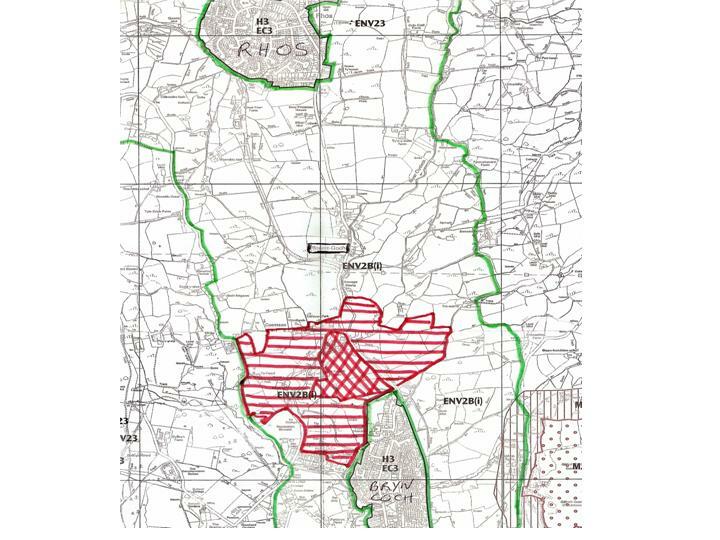 The red, cross hatched area represents the current proposal of the inspector to remove the proposed development land for 200 + houses and extend the settlement limit of Bryncoch. The larger horizontally hatched area is the area considered by the council, for the building of 2000+ homes, which they rejected. Once the infrastructure, sewage, road improvements etc. has been put in for the current proposal we believe it would be only a matter of time before development was considered for this larger area.